Summer is well on its way. We’re quite happy about that at Athom. However, the sun is not always ideal. When looking at screens, the sun can jeopardise our creativity and productivity, or spoil our fun when watching TV. Thankfully, Homey can control devices such as automated blinds. Adding a set of blinds to Homey is really easy. Next, you can create some really useful Flows, allowing Homey to take full control over your blinds. Once paired, you can use the Homey Smartphone App to control each set of blinds in your home separately, or have them react to your commands as a group. When shopping for automated blinds, you’ll – of course – want to make sure you’re buying a set of blinds that work with Homey. Thankfully Homey supports a wide variety of motorized blinds. This is mainly because in the end, manufacturers use a limited number of motors. 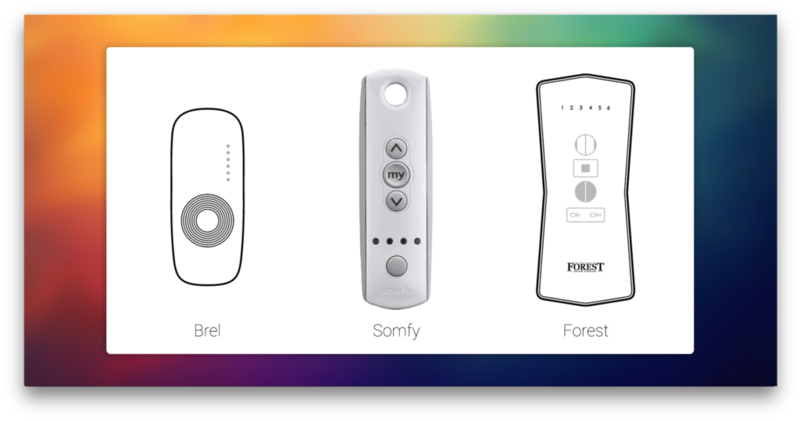 Homey supports wirelessly controlled motors from Somfy RTS, Brel and Forest. However, these brands are often hidden inside the products of other manufacturers. For instance, brands like Verano use Somfy motors, and Sunway uses Brel. To know whether a set of blinds works with Homey, you can ask the seller which motor is included. Another good bet is to take a look at the remote control that comes with your blinds. Despite the fact that some manufacturers re-label the remotes, they keep the physical appearance. So if the remote looks like one of the remotes below, the odds are definitely in your favour. If you already have motorized blinds which are wired, don’t worry. You can easily implement them as well by using ‘roller shutters’. Roller shutters are built-in modules that control motors. Kind of like dimmers, but then for motors instead of lamps. Qubino, Fibaro and KlikAanKlikUit make roller shutters. All of which – of course – work with Homey. To add a set of blinds to Homey, open the Homey Desktop Application and add a device. In this case we’ll be adding a wireless blind from Verano, with a Somfy motor inside. Click the ‘add device’ button and look for the brand corresponding with your automated blinds or roller shutters. Install the Application, and select the blinds you have. 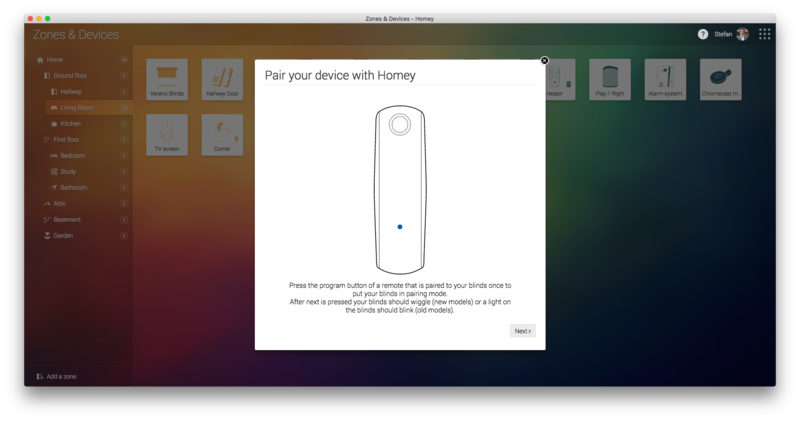 After adding the ‘Somfy RTS motor’, Homey will ask you to set your blinds in learning mode (other brands may ask you to press some buttons to copy the remote). Since Homey shows us an image of what the remote looks like, this is fairly easy. 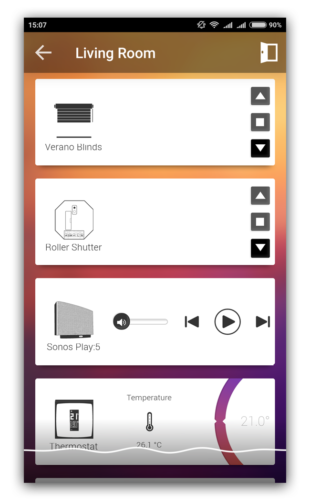 Now that they are connected to Homey, you can control your blinds with your mobile App! Just open the Homey Smartphone App and feel the magic. Just tap the up, down or stop buttons on the card of the blinds to control them with your smartphone – from anywhere. Now that Homey knows we’ve added a pair of blinds to its ecosystem, it’s time to have some fun with Flows. Homey knows the functions of your blinds. Control these functions with your Homey Mobile Application or Homey Desktop Application, or through the Flow Editor! We’ve created the basic functions of our blinds. Now, let’s be creative. If you have more than one set of automated blinds, you can make them react the same way to one command. Or, like at our office, you can split them up into zones. All of the desks that are next to a window have their own set of blinds. This allows someone at desk 5 to control the blinds at desk 5, without adjusting the blinds at desk 3. By delving deeper into Flows, you can even make Homey adjust your blinds automatically when it starts raining! Or dim the lights and close the curtains when you’re watching a movie. The possibilities are endless. I’ll have to make sure they read this at the office. Going away on Holiday? Here are some tips to secure your home.